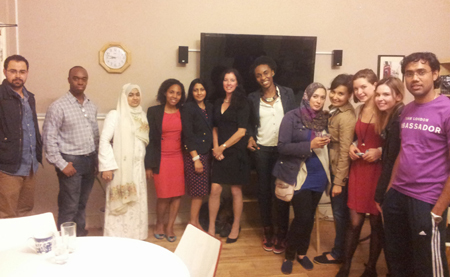 This has been one of the most inspiring as well as busy weeks in the UPF-UK and also for the YouthUPF teams. The UN international Day of Peace beautiful concert, “Music For Peace in the Middle East” performed by people from Israel & Palestine, the Ambassador for Peace meeting focussing on 'Growing Through Overcoming Challenging Relationships', and the Youth UPF event, 'An Evening With Nicola Bailey'. Nicola Bailey is a passionate Assistant Head Teacher and her school Head of Parent and Community Support. She specializes in working with complex sets of stakeholders to accomplish enhanced educational performance among children who have more than average challenges to overcome. Nicola Bailey said, 'In one of the most difficult jobs I had, there was a psychologist who would come in to perk our spirits up before we started work. She said to us, “State three highlights of your day”. She encouraged us to look at what happened in our day that we could be happy about. If it was hard to find something then to look at what difficult things could have happened in our day that didn’t and be grateful. Little practical changes are also really useful. For example, I didn’t allow clients to call after 4:50 so I could leave work on time.' She does this everyday in order to maintain a positive mindset that sets the tune for staying motivated. Nicola Bailey was very passionate, discussing with us her journey as well as answering each of our questions on various topics including the education of young people. I really liked that Nicola described how the communication used affects the development of children. I always saw a link but couldn’t quite articulate it until it was explained so clearly. Reading, giving reasons to why we ask children to do things, is very important. If we speak mostly in commands with no explanation, we limit the child’s explorative nature. The family is the first school, the school of love. Children learn so much with their parents. It would be good if parents could be more connected to the children during their school years. She explained how she managed to get parents involved in her school. While she knew and acknowledged that there was a major problem in maintaining literacy levels so as to not fall behind other nations, Nicola is someone who is up for the challenge of doing all she can to help those for whom she is responsible to fulfill their talents. She describes the point where pupils come to understand that 'they can do this' as being when 'the magic happens' and their life expectations rise dramatically. All the young people left very inspired after sharing a good time with her. She was very open, passionate and honest. All this was visible during her interview and the networking time with the youth.